Earlier, we conquered the eating part of St. Patrick’s Day, and now it’s time to get down to some well-deserved drinking! I’ve created a signature cocktail which I call the Potato Colada. 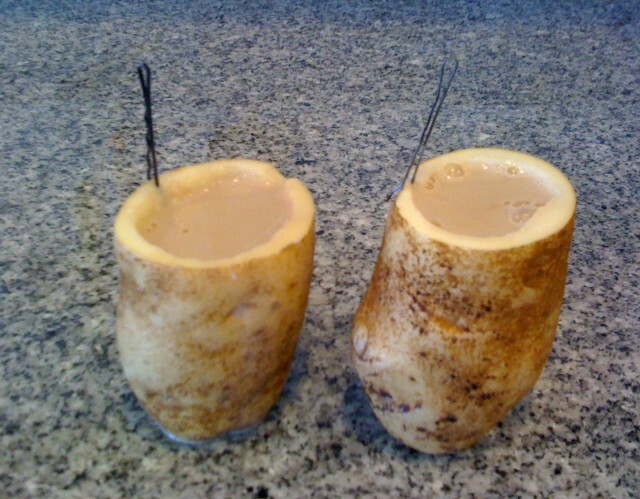 It combines so many of the things that make Ireland great (Irish Creme, milk, tubers) into one mouth-watering beverage. Essentially, this cocktail is like alcoholic chocolate milk, which — let’s face it — is the best of all possible worlds. I was originally going to serve it in a regular old glass, but then Edith suggested we drink them from potatoes, which we will obviously do because a) there is nothing more Irish than a potato, and b) how many times in your life do you have the chance to drink out of a potato? OK, let’s dive right in, because the faster we make them, the faster we can drink them!!! -Combine equal parts Irish Creme and milk in a glass or pitcher. I used 1/2 cup of each, and it was more than enough to fill 2 potatoes. -For every cup of liquid you use (just eyeball it), add one tablespoon of chocolate syrup. 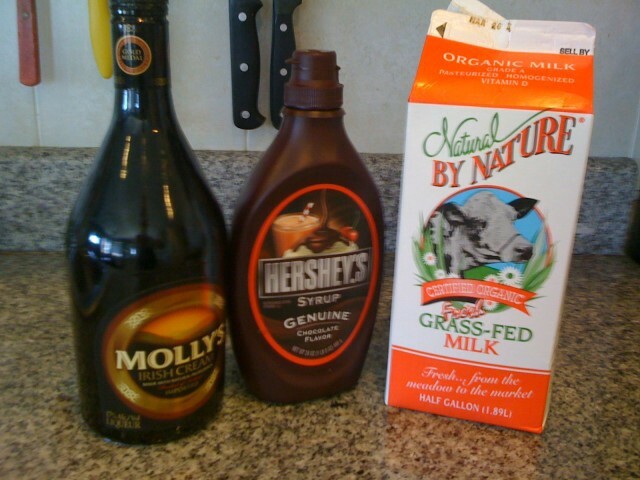 -Mix it all around with a spoon until the syrup is dissolved. Taste it to make sure it’s chocolate-y enough for you. If it’s not, stir in more syrup. Then stick the whole thing in the fridge while you get the potatoes prepped. -Scrub the potatoes clean, and pat them dry. -Cut a bit off one end (maybe 1/4 of the potato), just at the point where the potato gets the widest. This creates the top of the “glass.” Then you’ll want to slice a tiny bit off the bottom, just enough so that there’s a small flat surface for the potato to rest on so it will stay upright. -Now you need to hollow out the potatoes. 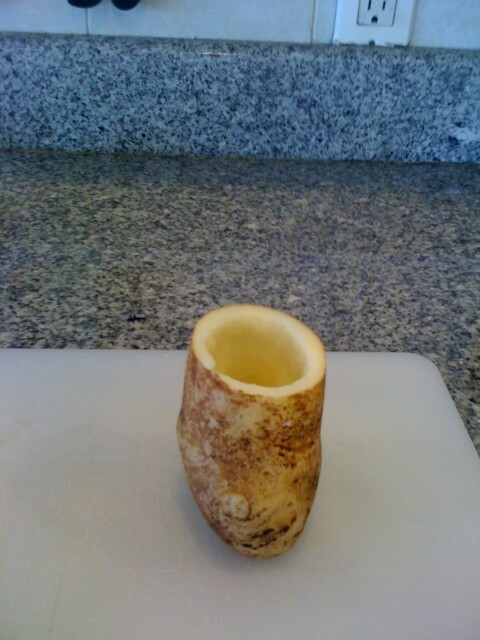 I used a teaspoon to carve out the insides — be careful not to get too close to the skin or your “glass” will spring a leak. Remove as much of the inside of the potato as possible, but be sure not to go all the way to the bottom. -Pour the drink carefully into each potato, and then garnish by stabbing one end of a hairpin into the side of the potato. And there you have it: Potato Coladas! As you sip an endless stream of these all night, I hope you take a moment to savor both the novelty of drinking out of a potato and the novelty of drinking chocolate milk that also gets you drunk. Happy St. Patrick’s Day to one and all!